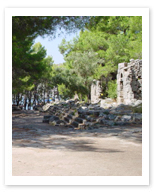 Beautiful and romantic, with three small bays surrounded by pine forests, Phaselis was founded by colonists from Rhodes around 690 BC, and due to its location and fine harbor, became a prosperous trading city. The city does contain some Byzantine and Roman relics and ruins, but the better examples are nearby in Perge and Aspendos. Its real draw, as you will see, is the beauty of the setting, which is best appreciated with a sunset, a glass of wine, and with absolutely no effort at all.